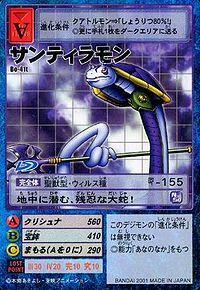 Difference between revisions of "Sandiramon"
One of the "Deva Digimon", it is a Perfect Digimon with a form resembling the Snake. 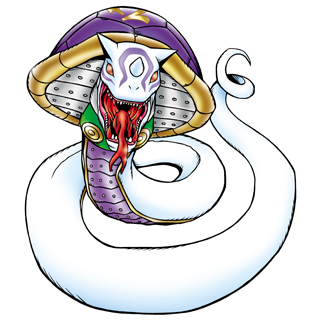 As a follower of the Four Holy Beasts Digimon Zhuqiaomon, it is the most cunning and cruel among the Deva. It doesn't like to decide matches in an instant, and prefers to instead choke the life out of the opponent while tormenting them bit by bit. It usually lives deep beneath the ground, and subterranean maneuvers are its specialty. During battle, it can produce a spear made of light, the Bǎo Kuí, from its mouth, and skillfully wield it with its tail wrapped around it like a hand. Although the Bǎo Kuí vanishes once it slashes the opponent, as long as Sandiramon's energy lasts, it can spit out any number of them, and they will not degrade in sharpness. Its Special Move is impaling the opponent by thrashing its body and then powerfully vomiting up a Bǎo Kuí (Krishńa). Virus type, Perfect level, Holy Beast type Digimon. 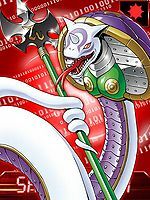 — Digimon Tamers: "Giant Snake Appearance! Great Edo Line, Great Panic"
| Sandilya (「サンディルヤ」 Sandiruya) is one of the Twelve Heavenly Warriors of Buddhist Mythology. 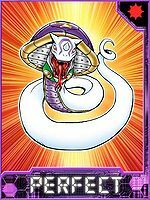 Anime/Manga Digimon Tamers: "Giant Snake Appearance! 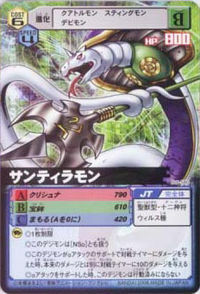 Great Edo Line, Great Panic"
クリシュナ Kurishuna Venom Axe A poisonous roar that dissolves anything it hits. Spits out a poison-drenched halberd shaped like a cobra. Sandiramon is one of the Deva sent to the Real World to capture Culumon. He first attacked in the subway system. Ruki and Renamon are in the tunnels coincidentally and encounter Sandiramon who escapes through the tunnels with Kyubimon and Ruki in pursuit. Jenrya and Terriermon encounter Sandiramon who destroys their train. Ruki sends Jenrya off to locate Takato and Guilmon. 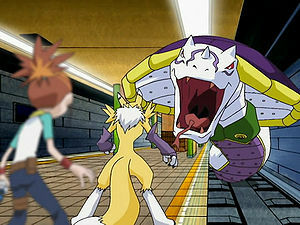 Eventually, Galgomon and Kyubimon catch up to Sandiramon and battle him, unable to defeat him. Takato and Guilmon literally drop in from a hole dug in the ceiling, Guilmon evolving to Growlmon. 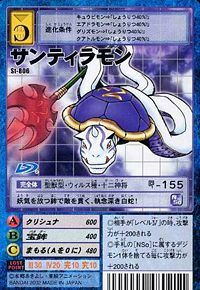 Takato uses a Card to boost the attack strength of the Digimon. They manage to defeat Sandiramon. He explains the rest of the Devas will soon arrive, before being deleted. Sandiramon can only be obtained as a collectible card. 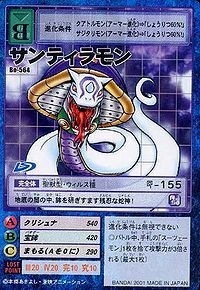 Its card is part of the Deva (十二神将（デーヴァ） Jūnishinshou (Dēva)) set and the Zhuqiaomon's Subordinates (スーツェーモン配下 Sūtsēmonn Haika) set. Sandiramon is available as a Digimon Medal. Sandiramon is available as a Digimon Card. 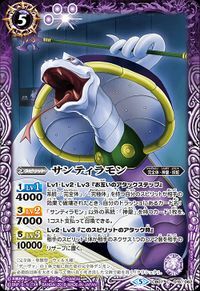 This tenacious white snake impales enemies with its ghostly lance! 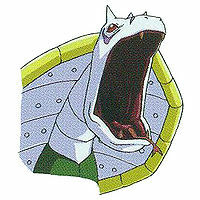 This cruel snake god sharpens its lance in the darkness deep underground! This large, cruel snake lurks underground! 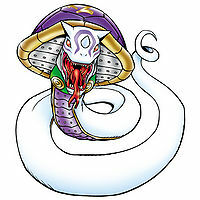 One of the "Deva", it is a Perfect Digimon with a form resembling the Snake. Its Special Move is impaling the opponent by thrashing its body and then powerfully vomiting up a Bǎo Kuí (Krishńa). ↑ Internet Sacred Text Archive, retrieved 08/31/07; Vishnu Purana, Ch. VI: "He who causes impotence, trespasses on others' lands, is impure, or who lives by fraud, is punished in the hell called (black, or) Krishńa."